Writing a negative is never easy, and there are certain books that make me feel extra crummy about it because I know the problem lies solely within me and not in the book itself. The Memory of Fire is a perfect example. It has a decent premise, a well-written story not marred by any serious technical problems, and it is also sequel to a debut I really enjoyed last year, called The Waking Land. So then, why didn’t I enjoy this second volume, especially since it continued to expand the overall series arc by exploring many of the same world-building and magical themes from the first book? The main reason: a different main character. 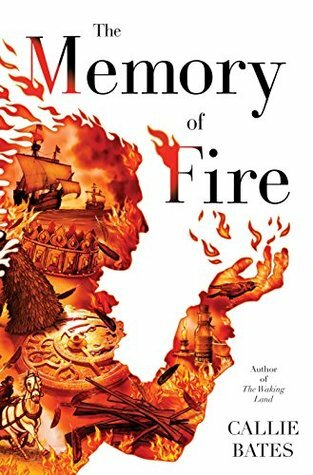 Instead of carrying on with the story through the eyes of Elanna Valtai, the wonderful star of the previous novel, The Memory of Fire changes tack and approaches things from the perspective of her lover, Jahan Korakides—whom I’m nowhere near as fond of. In fact, I came to downright detest him in the first book, as I found his personality to be incredibly dull and his romance with Elanna emotionally flat. As far as I was concerned, Jahan was little more than a distraction and an excuse for a romantic side plot, so I can’t say I was all that thrilled when I started the book only to discover that not only was he the focus of the sequel, we were actually getting the entire story from his point-of-view. That being said, I was more than willing to give this novel a chance to change my mind. Learning about a character’s background and the experiences that helped shaped him can do wonders to alter existing perceptions, and I was hoping this book would warm me up to Jahan. We weren’t introduced to him until well into The Waking Land, and as a result, readers knew relatively little about his past and origins, except that he was a nobleman from Ida, and that unlike Elanna, he’s had a good grasp on his magical abilities since he was a child. In The Memory of Fire, we get to find out exactly how Jahan developed his powers. The story takes us back to his homeland after he and Elanna’s time in Caeris is cut short by news that the empire of Paladis is planning an invasion. With Elanna’s powers exhausted from trying to restore the land, Jahan is forced to return to the court where he grew up to try and negotiate peace with the emperor. But in Paladis, Jahan faces many challenges. With magic being outlawed and punishable by death, he must keep his powers under wraps, especially now that his friend Prince Leontius has turned his back on him, taking away any form of royal favor or protection. Worse are the political games he must play, as old enemies try to undermine the throne and threaten to reveal Jahan as a sorcerer. Returning home also means confronting his past and the painful memories of what happened to his family. Jahan is still plagued by memories of the manipulative witch Madiya, who secretly trained him and his brothers in magic—and caused a lot of emotional damage while doing it. Now her ominous messages to him are making it more difficult to focus on his mission, putting him in danger of being exposed. I confess, I had really hoped reading a book from Jahan’s POV would change my impressions of him and make him more favorable in my eyes, but unfortunately, that just didn’t happen. I tried, I really tried. But far from getting me to get over my dislike of him, I think this novel merely exacerbated it, because I constantly found myself wishing we were still following Elanna–which isn’t fair, I know, since this is supposed to be Jahan’s chance to shine. To be honest though, his story just wasn’t anywhere near as interesting to me, especially since a good chunk of the first half was dominated by tedious political talk and the protagonist’s own fits of self-flagellating whining as he berates himself over and over for leaving his brothers in the hands of Madiya. Look, dude, you did what had to be done. Move on, and let’s get to some action already. Thankfully, we saw the story pick up in the second half. The Memory of Fire is not only darker, but it is also more melancholy in tone compared to The Waking Land. It’s a good thing, I think, because this gives the series a bit more gravitas and shows it in the process of maturing into something greater. However, I don’t know if this is enough to overcome my ennui and lack of interest for most of this novel. I’m still rather apathetic towards Jahan, because he never really captured my attention the way Elanna did in the previous book. With her, the connection came effortlessly, in contrast to the narrative of this one, which tried a bit too hard to push Jahan upon the reader and, ironically, only served to drive me farther away. Changing protagonists midway through a series is always a huge gamble, even if the story does require a different point-of-view in order to move forward. Callie Bates took the chance, and unfortunately, it didn’t pan out too well for me, though I’m sure it will work out just fine for plenty of others. In fact, if you enjoyed Jahan’s character in the first book, then there’s an excellent chance that you will enjoy The Memory of Fire. If you didn’t though, then your experience may be more touch and go. At this point, I’d still very much like to continue the series because the author is such a great writer, plus I love the world and the magic in these books. But if the story doesn’t return to Elanna, or at least focus more on her again, then I might have to reconsider. I guess we’ll just have to wait and see. Yeah, I’ll make sure to do my research this time and find out who the story will follow before I take the plunge, lol! Sometimes it’s really disappointing when a book doesn’t click with you. Yeah, I actually feel kinda bad not liking this one, since it’s mostly based on my dislike of the character. Well that was really disappointing! Why change pov!? Hmm yeah, changing your protagonist can lose your audience through a series, especially if it’s switching to a character you didn’t like before. 😂 Also, more melancholy tones appeals to me too (as you say, gravitas is a good thing) but if you don’t connect to your MC, you don’t connect to the book. Great review! A character who keeps “whining and self-flagellating himself” can’t carry the weight of a story on its back, so I can understand quite well your frustration with this book…. Yikes… A sequel that suddenly decides to shift its focus onto a different character. That sounds extremely risky, and definitely didn’t help your case here. Great honest review. Dang, sorry to hear that this didn’t live up to your expectations! You’re right though, changing protagonists is a big gamble and it won’t always pay off. I’m happy I know about that before reading The Waking Lands (which is on my TBR) because maybe it’ll change my perspective on Jahan — assuming I dislike him. Ahh, that’s a shame, I remember how much you liked the first. Changing protagonists is certainly a risky thing to do and can knock readers off. Hopefully the next book will be an improvement. Great Review! I’m sorry this one was a bit disappointing though. Thank you for your kind words! And yeah, I’m hoping the next one will be different. Character is everything though – it seems to come down to this every time for me at least: do I like this person/creature/individual? And if it’s a ‘no’, it’s too hard to see past that. I’m really not a fan of having the different MCs for different books. If I’m invested in the MC in book one, I want the next book to follow that character so I can see their development through the plot.